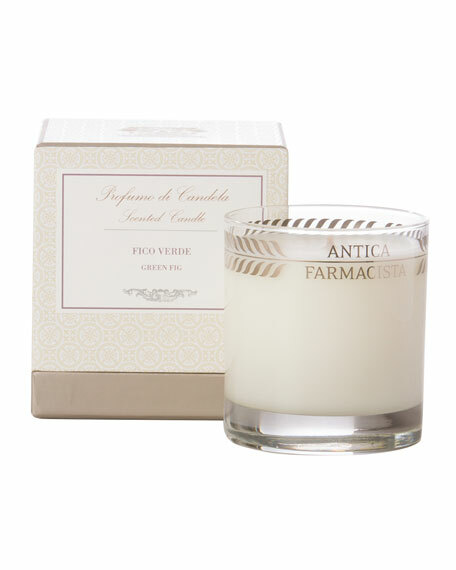 Antica Farmacista Fig Leaf Scented Candle, 9 oz. Antica FarmacistaFig Leaf Scented Candle, 9 oz. Antica's premium, clean-burning, soy/paraffin wax with all-natural wicks. 60 hours of scented illumination, Our nine ounce candle is beautifully produced in a clear glass vessel with our platinum leaf pattern and packaged in our pedestal presentation box. For in-store inquiries, use sku #158960.